Airport Auto Sales is not your ordinary pre-owned car dealership! We are a family owned business that has provided over 8000 vehicles to the local community! Over the past 20 years, we have invested in our staff, our vehicles and our dealership so that we may now offer you the BEST buy here, pay here experience possible! We are the only TRUE buy here, pay here dealership in the area. We do not sell your loan after you purchase. We are committed to you until you pay off the loan and pick up your title! We even encourage early pay-offs! No pre-payment penalty! Our main goal: to treat you like family because family is for life! NO CREDIT CHECK! All you need is a drivers license, full coverage insurance and a minimum down payment of $850! We also accept trade-ins! Just bring your vehicle by for us to do a 15 minute evaluation and we will have you upgraded in no time! We handpick the cleanest, nicest and most reliable pre-owned vehicles for every need, taste and style. We then offer the simplest financing with weekly payments of $75 on everything so you get the car, truck, minivan, or SUV you want and can afford! We personally work with you to make sure Airport is there for you when you need us! If there is one thing we know, its reliable pre-owned autos. All vehicles are quality inspected for your safety and security. We include our signature Life of Loan Service Contract with every purchase! 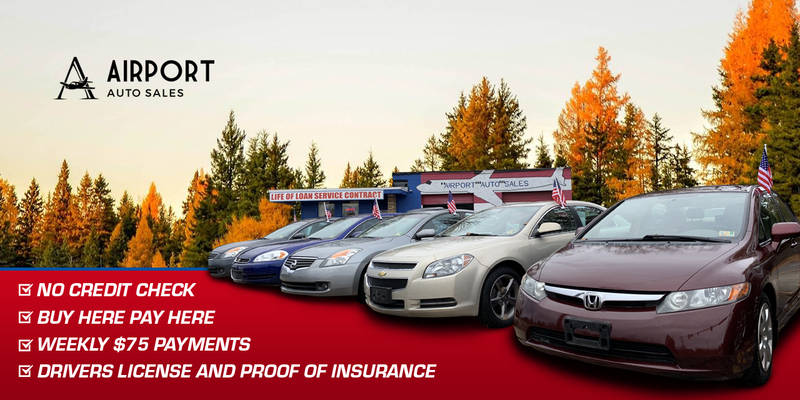 All you have to do to maintain 50/50 coverage is maintain your vehicle with us! 2004 Honda Pilot EXL 4WD! 2004 Honda Pilot EX AWD! 2006 Honda Civic 2dr Coupe! 2012 Ford Escape XLT – Reduced Down Payment! 2009 Ford Edge SEL – AWD! 2007 Ford Ranger with only 106k miles! 2006 Honda Pilot EX-L- AWD! 2009 Chevrolet Trailblazer LT 4WD!!! 2003 Chevrolet S-10 Truck 4WD!! 2006 Chevrolet Trailblazer LS 4WD! 2006 GMC Yukon XL SLT 1500 LOADED! 2002 Dodge Ram 1500 – Only 52k Miles! 2004 Toyota Highlander Limited V6 4WD! Seats7! 2007 Jeep Liberty Sport 4WD! Life of Loan Service Contract.